Now when you think of yurt, most people think of the Mongolians but not many of you think wedding venue. 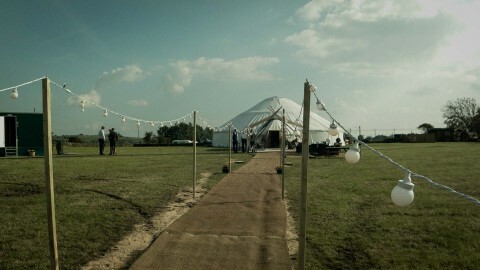 We've been to our fair share of wedding venues this year, but nothing like this.Out in the picturesque Staffordshire country, lies a field filled with Yurts, and on this particular day, dwarfed by the biggest Yurt we have ever seen. Staffordshire based glamping company, Secret Cloud House Holidays, were the providers of this enormous Yurt. Fitting an entire wedding party inside for the wedding breakfast, outside was surrounded by fairy lights and wood fires to keep the guests warm, the yurt was then converted for the evening reception, fitting in a live band and MULTIPLE bars! For more information about these Yurts, head on over to the Secret Cloud House Holidays and keep an eye out for our latest wedding video to see more on the Yurt.